Revelations of illegal eavesdropping sparked the closure of a 168-year-old newspaper and led to several wide-ranging criminal investigations that have seen dozens of journalists and officials arrested. LONDON — The trial of two former top editors of Rupert Murdoch’s shuttered News of the World tabloid began Monday with the selection of a jury to hear the lengthy, high-profile case sparked by Britain’s phone-hacking scandal. Rebekah Brooks and Andy Coulson — both former senior Murdoch aides and associates of British Prime Minister David Cameron — are charged with phone hacking and illegal payments to officials. They sat in the dock at London’s Central Criminal Court alongside six other defendants on the first day of a trial that Judge John Saunders said could last up to six months. The Associated Press Rebekah Brooks arrives at The Old Bailey law court in London Monday. The former News of the World national newspaper editor and her colleague, Andy Coulson, are on trial on charges of hacking phones and bribing officials while at the now closed tabloid paper. This is the first criminal trial stemming from a tabloid phone-hacking scandal that erupted two years ago. Revelations of illegal eavesdropping by the News of the World sparked the closure of the 168-year-old newspaper and led to a judge-led media-ethics inquiry and several wide-ranging criminal investigations that have seen dozens of journalists and officials arrested. Brooks arrived early for the hearing alongside her husband Charles, who faces a related charge of obstructing justice. The eight defendants — all former Murdoch employees except for Charles Brooks — chatted in the glass-enclosed dock in a windowless courtroom dotted with more than a dozen bewigged lawyers set to argue the complex case. All the defendants deny the charges. The prosecution is expected to begin opening arguments on Tuesday. The three highest-profile defendants are: Brooks, 45, a former editor of the News of the World and former chief executive of Murdoch’s British newspapers; Coulson, 45, another former News of the World editor who was Cameron’s communications chief until 2011; and Brooks’ 50-year-old husband Charles, a racehorse trainer. He was the elusive figure — rarely photographed — behind Cameron’s canny media strategy. She was the flame-haired, high-flying editor who exchanged text messages with her friend and neighbor Cameron while overseeing Murdoch’s politically powerful British newspapers. They face trial alongside former News of the World managing editor Stuart Kuttner;, ex-news editor Ian Edmondson; former royal editor Clive Goodman; Rebekah Brooks’ former assistant Cheryl Carter; and Mark Hanna, former security chief at Murdoch’s News International unit. Brooks and Coulson are charged with conspiracy to intercept communications — phone hacking — and with conspiracy to commit misconduct in a public office, which covers bribing officials such as police or prison guards. The other former News of the World journalists face related charges. 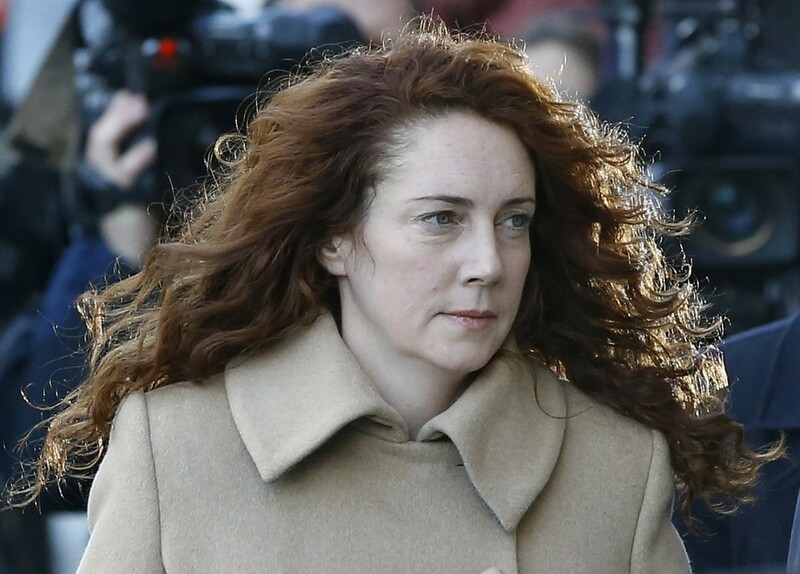 Rebekah Brooks, Charles Brooks, Carter and Hanna are also accused of conspiring to pervert the course of justice by removing material from the company’s archive and withholding computers and documents from the police. The furor led Murdoch to close the News of The World and triggered police investigations into phone hacking, computer hacking and the bribery of officials, probes that have expanded to take in possible wrongdoing at other British newspapers. The central questions are: What did Brooks and Coulson know, and how widespread were the illegal practices when they ran the newspaper? Brooks edited the paper between 2000 and 2003; in 2002, it hacked the mobile phone voicemails of a murdered 13-year-old, Milly Dowler, while police were searching for her. (Brooks denies knowing about any of the hacking). Coulson was in charge from 2003 to 2007. Not likely. The hacking scandal convinced many politicians and members of the public that Britain’s press was out of control. Cameron ordered a judge-led inquiry into media ethics, which recommended an independent press regulator be set up with state backing. Many editors and journalists fear that could lead to state regulation but they may find it hard to resist amid a new blare of publicity about media misdeeds. Revelations at the trial also could heap new pressure on Murdoch, who remains atop his now-fractured media empire. The scandal led him to shut down his best-selling newspaper, pay millions to settle lawsuits from hacking victims and split his News Corp. media empire into two businesses, a publishing company and a media and entertainment group.